My good friend of the force Roy Waung writes in to share with fans their milestone ten year anniversary of being online. Roy is a fellow fanboy who took his passion for Star Wars online to network with other fans around the world. Here's to another 10 Roy! 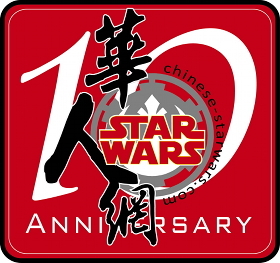 "November 8th is the 10th anniversary of my web site chinese-starwars.com , the web site that has gathered Chinese Star Wars fans from Taiwan, Hong Kong, Mainland China and overseas Chinese for a decade. For the past decade since the year of 2002, chinese-starwars.com has hardly step-by-step influenced and turned the tradition oriental culture of the Chinese communities from the so called "Star Wars desert" to an oasis with so many fruitful results. From so many successful local events of Star Wars to the establishment of the first Chinese 501st unit of Taiwan (chinese-starwars.com/501), 501st units of Hong Kong and China, then the establishment of an independent web site for fans in Hong Kong."